Notes: Muness Castle is located on the island of Unst, Shetland, off the north coast of Scotland. The castle is 3 kilometres (1.9 mi) east of the village of Uyeasound. Unst is Scotland's most northerly inhabited island, and Muness is the most northerly fortalice in Britain. The castle was built from 1598 for Laurence Bruce of Cultmalindie, half-brother to Robert Stewart, 1st Earl of Orkney. Earl Robert was succeeded by his son Patrick in 1593. 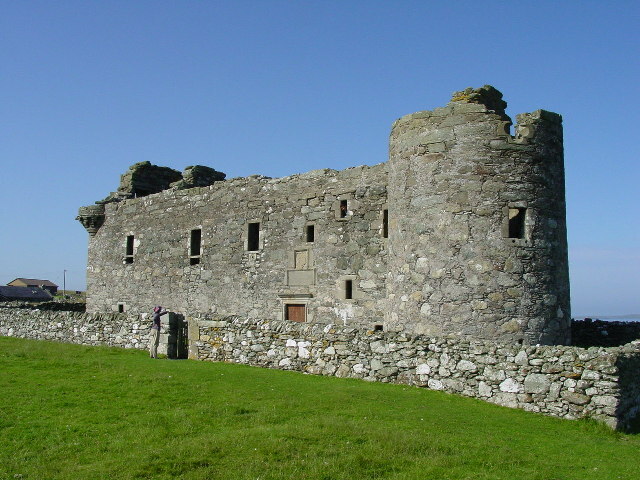 The building may have been constructed under the direction of Andrew Crawford, Earl Patrick's master of works, who also oversaw construction of Scalloway Castle and the Earl's Palace at Kirkwall, Orkney. In 1627 the castle was burnt down, and may never have been fully repaired. The castle is now roofless and missing its upper storey. Aerial photographs reveal the possible presence of a formal garden to the south-west of the castle. It is in the care of Historic Scotland, and is a category A listed building.